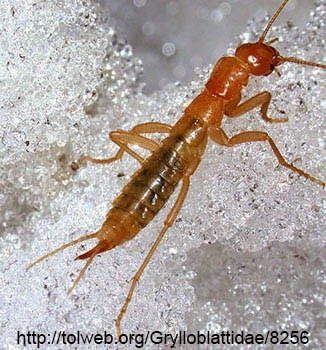 Grylloblattodea are either an order or a suborder of insects, depending on who you ask. You can call them ice crawlers or rock crawlers. There are a confusing group, even their name suggesting that they have some characteristics of both crickets and cockroaches. Most insects thrive in hot weather, but these guys have evolved specifically to increase their metabolism in the cold. Their optimal living temperature is between 1 and 4 degrees Celsius. They live close to the soil among sheets of ice and sometimes even among glaciers. They feed mostly on dead arthropods. Ice crawlers can be found in mountainous regions of Northern Asia and the West of North America. As I mentiones there are some entomologists who think the Grylloblattodea should be an Order unto themselves, but for now I am happy to call them a suborder of Notoptera, which also includes Mantophasmatidea. 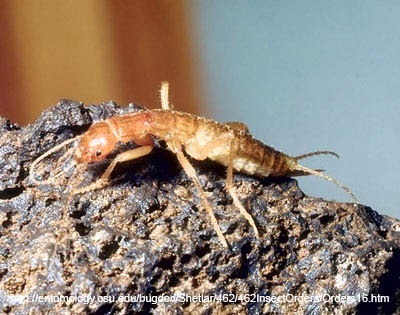 The closest relative to the Notoptera is probably either Dermaptera or Orthoptera or both.